Simple and simply delicious. In Germany also sold in kiosks on the street. With suitable grating potatoes and onions cut into julienne strips and add the beaten eggs, flour and other ingredients. 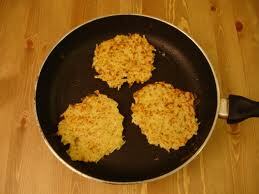 With your palms to form pancakes and cook in hot oil (in Germany use a special grease for frying, but I do not like). They are good withboth savory applesauce.